The people of Israel were carried away to Babylon, where they lived as exiles and outcasts. God sent this judgment on His people because of their continued unfaithfulness to His word-but the day came when He called them to return to Jerusalem. However, when they arrived there, they discovered things had dramatically changed for the worse. The Temple was destroyed, the city walls were torn down, and the land had been taken over by people who did not want them back. There was work to be done, and it was not going to be easy. In this study, John MacArthur guides readers through an in-depth look at the historical period beginning with Ezra's early return to Jerusalem, continuing through the teachings of Israel's prophets during the time, and concluding with Nehemiah and the people's rebuilding efforts in the city. Studies include close-up examinations of Ezra, Nehemiah, Haggai, Zechariah, and others, as well as careful considerations of doctrinal themes such as "Unequally Yoked" and ""Worshiping God." 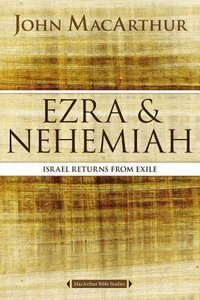 About "Ezra and Nehemiah: Israel Returns From Exile (Macarthur Bible Study Series)"